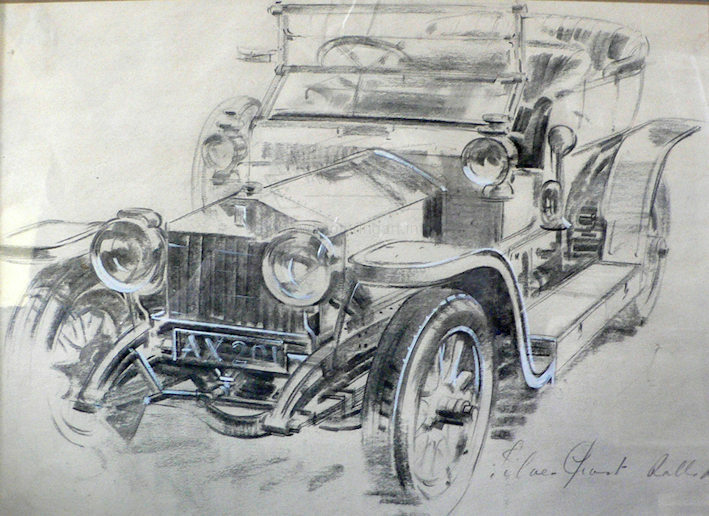 Frank Wootton is in some people’s opinion the best UK motoring artist, even greater than Gordon Crosby. 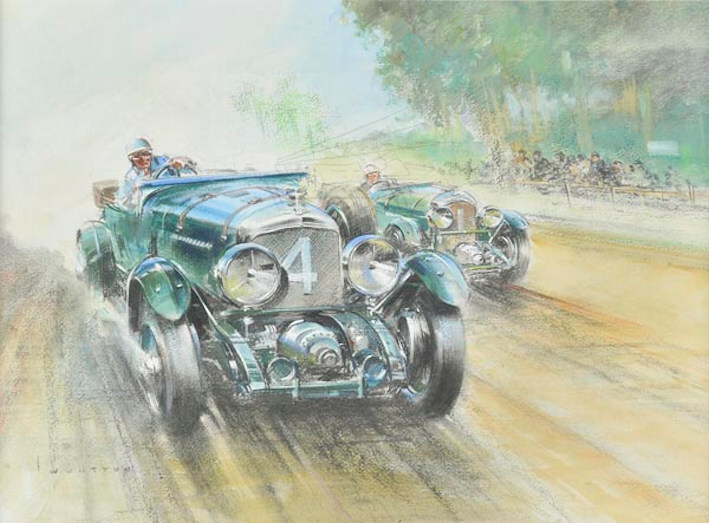 Yet Frank Wootton is better known for his aviation art and the period in life which he worked on motoring art is relatively short. 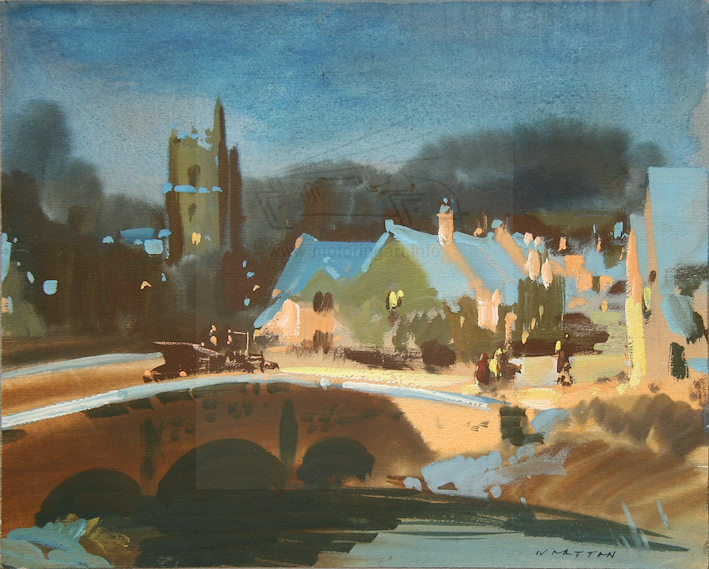 Frank Wootton was born in 1911 and from the early days always wanted to be an artist. He studied art at Eastbourne School of Art before gaining scholarships for overseas travel. In the 1930’s he was a commercial artist doing advertising and book illustrations etc. 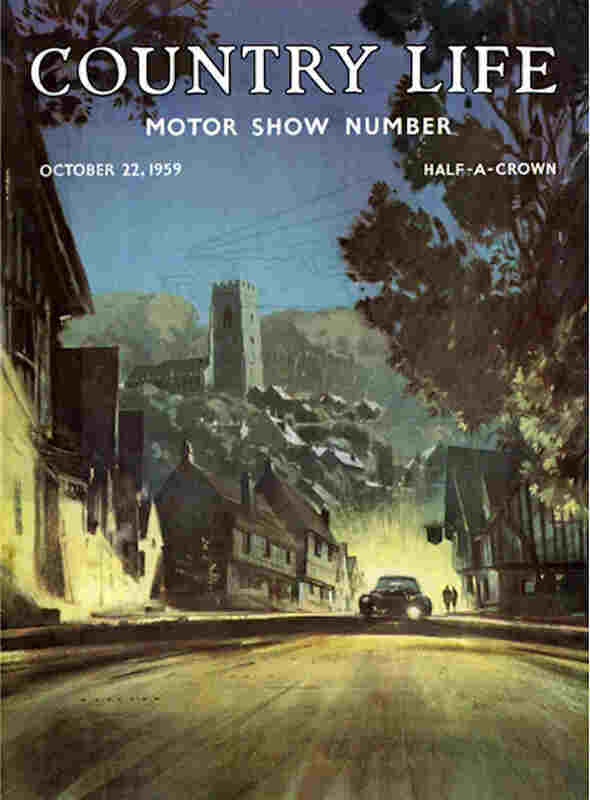 He also worked on motor manufacturers’ sales brochures and could remember art for Ford. However, these were not signed. 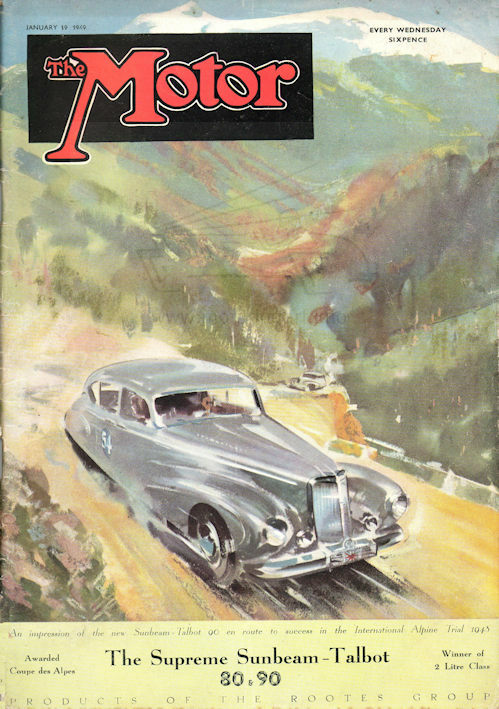 Hence it is difficult to identify his pre-war motoring art. He had been interested in flying so on the outbreak of war tried to join the RAF. Initially he was told to await call up but was commissioned to record the work of the Royal Canadian air Force in the UK. 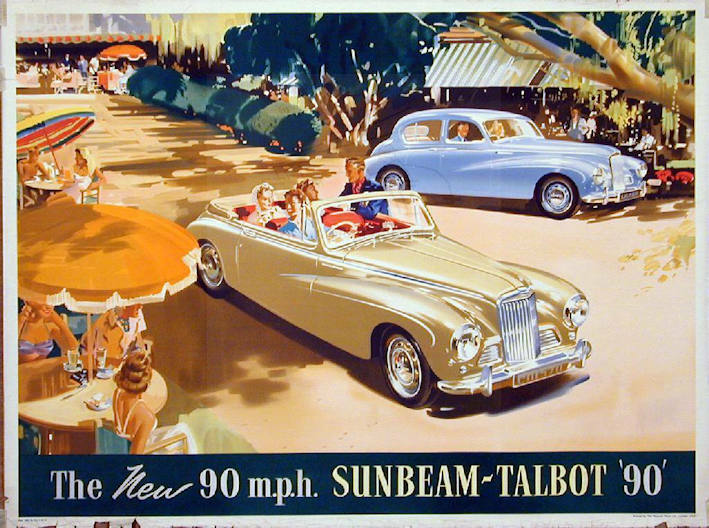 He joined the RAF in 1940 initially working on technical manual illustrations. However, in 1944 was offered a special commission to record the work of the RAF in the forthcoming invasion. He painted some excellent works of the war scene in the UK, travelling to Europe with the liberating forces and on to the war in the Far East. Many of these paintings hang in the art gallery at the RAF Museum at Hendon. 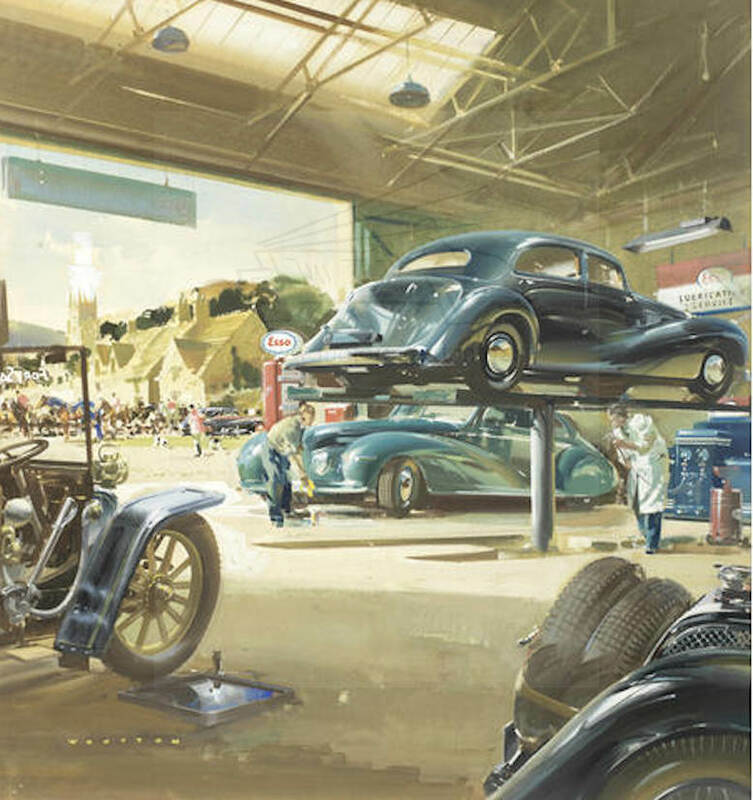 After the war he worked as a commercial artist for several studios continuing the aviation, but increasingly motoring art. 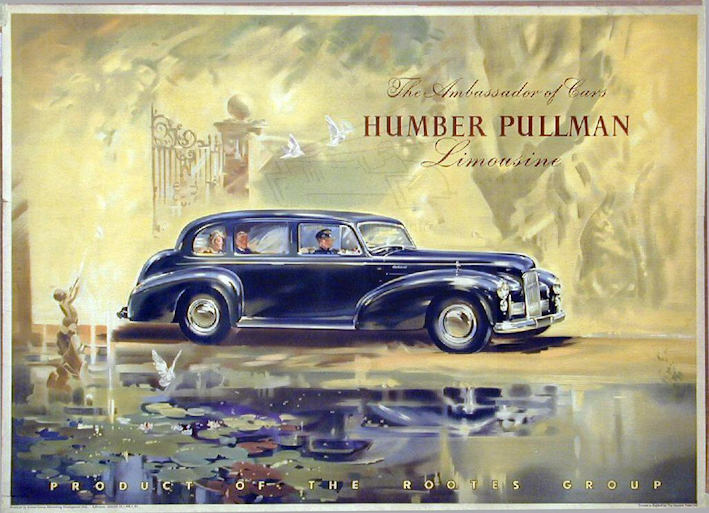 This was for a variety of manufacturers, mainly the Rootes group and also motor suppliers such as Lucas. (He completed some notable Lucas paintings of English landmarks and villages in the glare of car headlights). 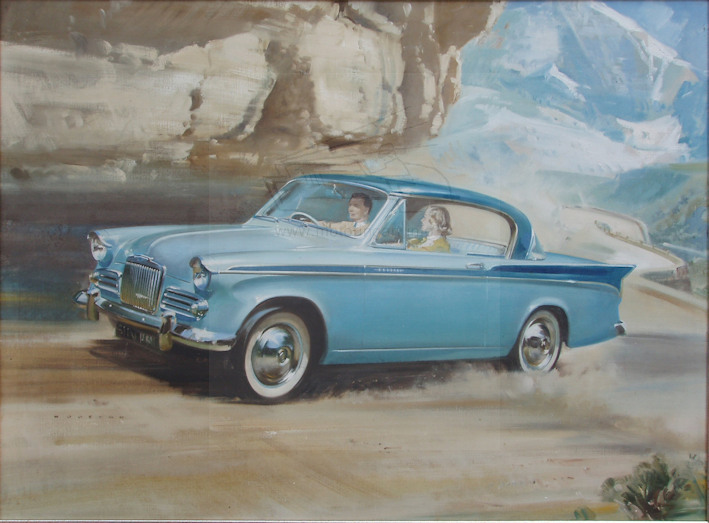 Motoring paintings were also used by Country Life for some of their front covers. During this time he also worked for The Motor on assignments covering such events as Le Mans and the Monte Carlo Rally. 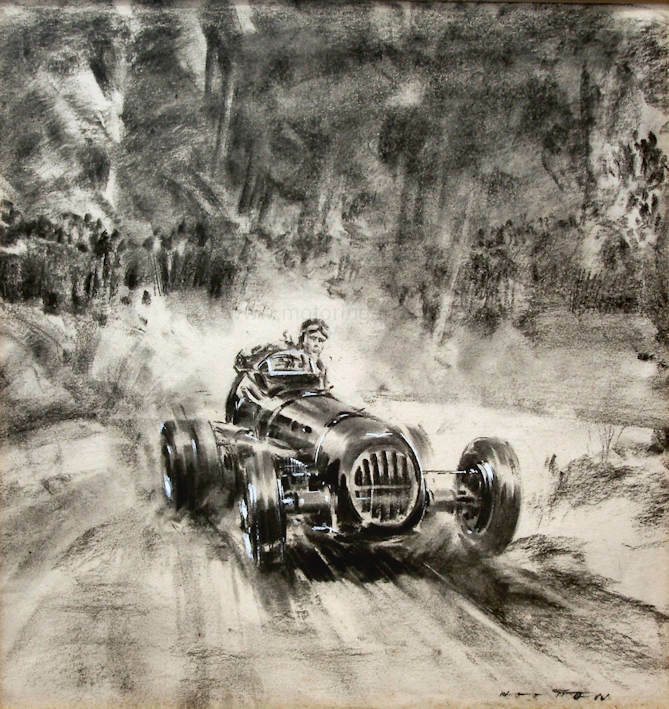 For The Motor he would normally produce charcoal or pencil sketches of the events. 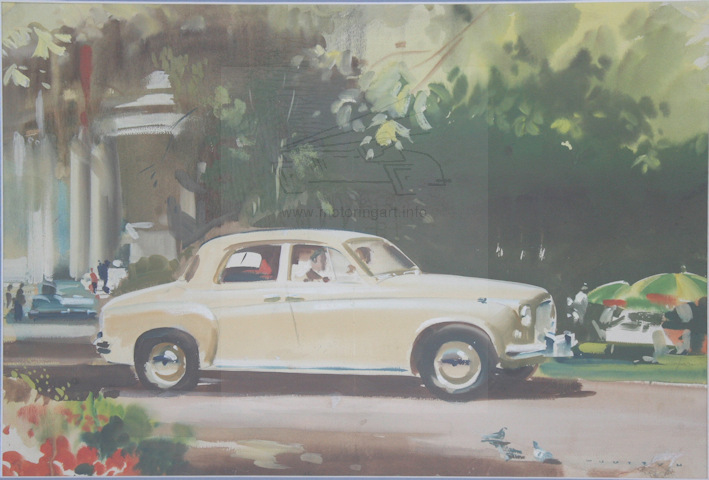 For the colour work he would often produce ‘roughs’ for approval before painting the final work. These part-finished roughs give his work an impressionist feel plus they are in bright pure colours. However by the 1960’s he was increasingly spending more time on Aviation art, particularly on travel posters for airlines such as BOAC. Asked why he did the travel posters he said motoring could not compete. If for example he was doing a poster for travel overseas he would be given first class airfares and hotels for himself and wife to the country to do the art plus he would be paid for the painting! Besides his aviation work, Frank Wootton was a noted landscape painter particularly well known for the South Downs scenes around his home in Alfriston. Also he was an excellent Horse painter admiring the work of Munnings. Frank Wootton had many honours in his lifetime including being the first President of The Guild of Aviation Artists but the greatest was his OBE awarded in 1985 for his services to the RAF during the war. 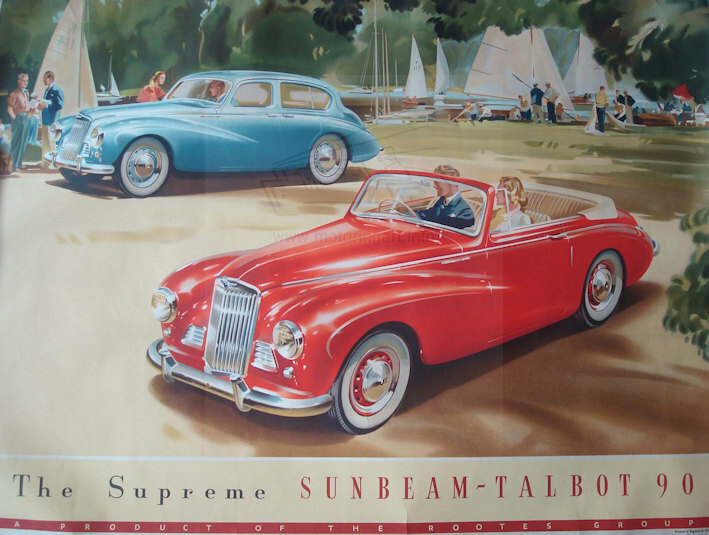 It is a great pity that Frank Wootton did not do more motoring art. His drawing ability was second to none plus his colour work is always full of life and speed. 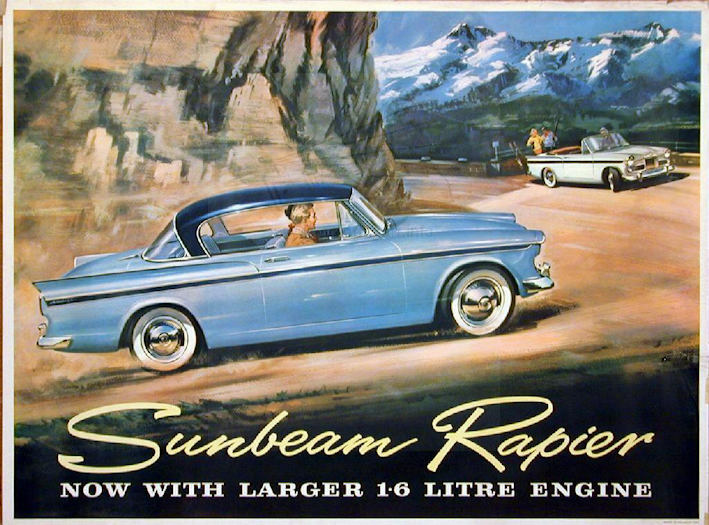 He was a master of making even a small mundane car look large and important by using less than life-size people. Many people credit Wootton with inventing this technique but many artists were doing this before the war. 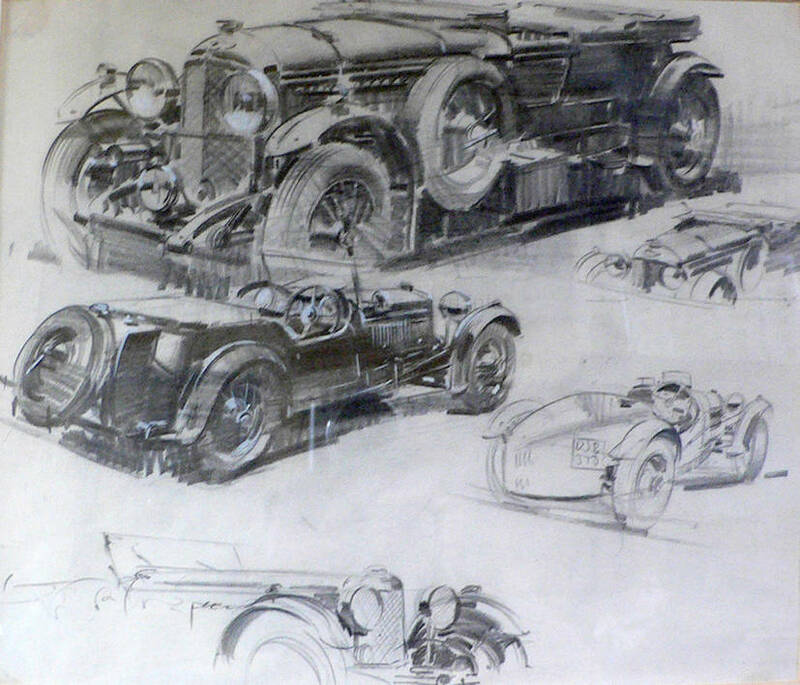 His charcoal drawings are excellent and some of these were used in a book he wrote ‘How to Draw Cars’ first published in 1948. This book went through a second edition in 1955 plus was printed in Germany. All these different editions have variations in the illustrations used. This was a companion book to the one first written in 1941 on ‘How to Draw Aeroplanes’ which went through a large number of editions. 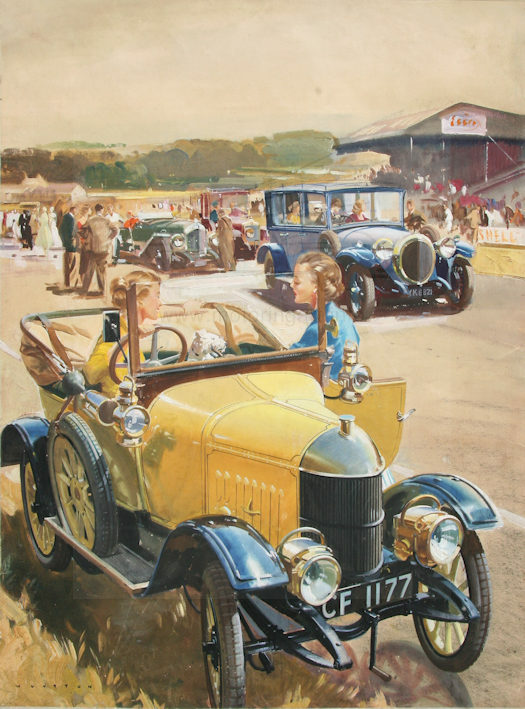 It is a testament to the quality of Frank Wootton’s art that many contemporary commercial artists imitated his style and if talking to older motoring artists many would say that Wootton’s work is their favourite. 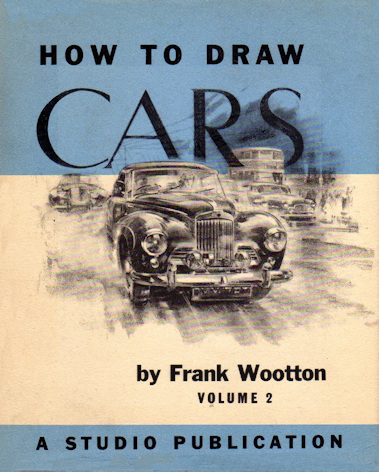 How to Draw Cars by Frank Wootton published Studio Publications 1949 and a different second edition 1955 Wie Zeichne Ich Autos by Frank Wootton published Musterschmidt-Studio 1957 Frank Wootton � A Career in Perspective by John Blake published by The Guild of Aviation Artists 2001 Plus there other books on aviation and landscape paintings.